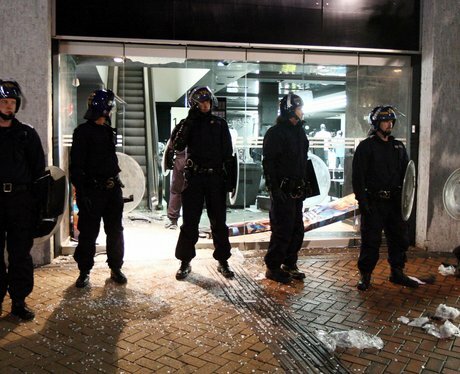 See the destruction and damage caused in Birmingham by riots and looting on Monday night. A general view of a McDonalds restaurant with a smashed window on Temple Row, Birmingham City Centre, as waves of violence spread north to central Birmingham, with police saying shop windows had been smashed and looting had taken place. View of a smashed mobile phone store in the city centre of Birmingham. Prime Minister David Cameron headed back to Britain to face the chaos. A mobile phone store window is seen smashed in the city centre of Birmingham.